Take on brand-new 2D side-scrolling action with a 'Burst Combo!' Enter a virtual world of cyber-landscapes and unravel the mystery behind its creation! 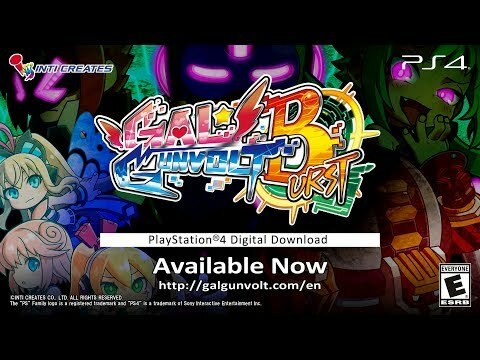 'Gal Gunvolt Burst' is a retro-style 2D side-scrolling action game with an authentic feel. Though the style will take you back to gaming in the 90s, new systems will keep the action fresh. Aim for a 'Burst Combo' by taking out enemies at close range. Choose a character with unique abilities and tune their attacks, defense and movement options just how you like it with the game's deep customization system. Gal Gunvolt Burst has the responsiveness and challenging gameplay of retro hits but with plenty of modern features you've come to expect. Play as 'Beck,' 'Gunvolt,' or 'Ekoro,' and experience their new stories in this unique parallel universe. ©INTI CREATES CO.,LTD. ALLRIGHTS RESERVED.